I didn't know where exactly the sequels, Pirates of the Caribbean 2 and 3, were filmed but some of the scenes just had to be in the Caribbean. 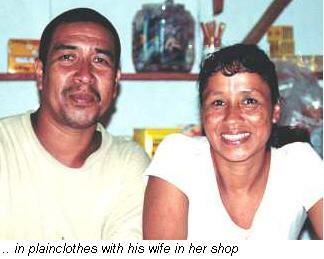 Then, in 2006, before going on our cruise, I booked a shore excursion on Dominica Island with Levi. He told me that a lot of the scenes for those 2 sequels were filmed on Dominica. He was a driver for the crew. 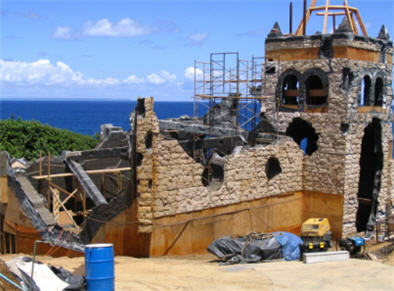 He sent me these photos of a ruined church (where Johnny Depp and Orlando Bloom are having a sword fight) that was built on an isolated peninsula below the village of Veille Case, especially for the movie. "We selected Dominica because it's beautiful and virtually untouched - and totally undiscovered by film-makers," said producer Jerry Bruckheimer. 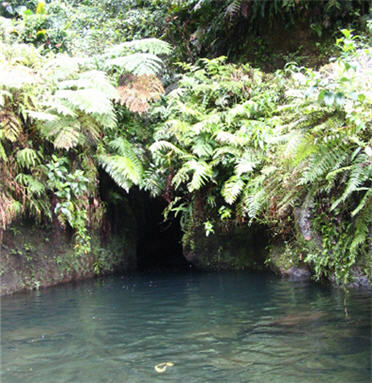 More than 25 locations in Dominica were selected as filming sites and were spread throughout the island. You can see the locations on the map of Dominica. I only saw one of those, TiTou Gorge, because there is not enough time to visit all of them. When we got there, our guide Levi, told us we could swim to the base of a waterfall through a small opening with high cliff walls on each side. 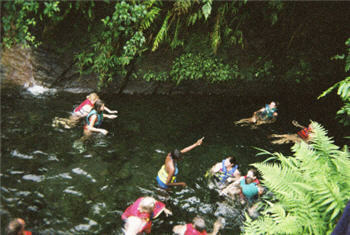 Ok so I'm not fond of getting wet when I'm on a shore excursion, but I'm also sooo not fond of cold water! So I stayed watching the others going in and took some pictures. Everybody seemed to have enjoyed their swim though. "Just when I was thinking that I had forgotten what it was like to be cold in sizzling hot Dominica, Pirates of the Caribbean 2 has a way of granting your every wish," says Kevin R. McNally. "So for the scene in which the bone cage drops into a gorge, they found the coldest water in Dominica and kept us there for two days! But TiTou Gorge was a fantastic place, only 10 feet wide and a sheer drop from the rock face to the beautiful, clear, cold water that we were in." But they were wearing wet suits!! If you have seen Pirates of the Caribbean 2, you'll remember at the beginning where Johnny Depp (as Captain Jack Sparrow) is sitting on a throne and appears to be the chief of a tribe of cannibals. Then of course they decided to eat him! Click on the big orange arrow below and you'll see some of these scenes. This "cannibal village" was built on the south-west coast, scattered across two hillsides, linked together by an 80ft-high rope bridge and overlooking the sea. 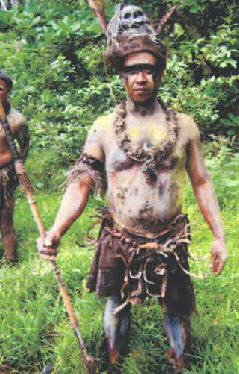 The island’s Carib Indians played the evil cannibals. "Around a hundred members of our community took part," said Irvince Auguiste, member of the Tribal Council of the community. "I had a skull at my head, a chain made of vertebrae around my neck, a belt made of ribs around my hips and my whole body was painted," reports Raphael Auguiste. "We had to chase Johnny Depp through the water and hang from rocks shooting arrows," said Auguiste, whose main job is driving a taxi. 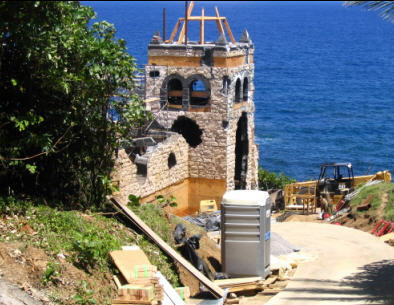 The filming lasted almost 8 weeks on the island of Dominica. Pirates of the Caribbean 2 and 3 were also filmed in the Bahamas, St Vincent and the Grenadines. Did you know: The BLACK PEARL was actually made in Mobile Alabama. It is self powered and has a licensed maritime captain on board.